Information om Office 365 Cloud App Security finns i Kom igång med Office 365 Cloud App Security.For information about Office 365 Cloud App Security, see Get started with Office 365 Cloud App Security. Flytta till molnet ökar flexibiliteten för anställda och minskar IT-kostnaderna.Moving to the cloud increases flexibility for employees and reduces IT cost. Men det introducerar också nya utmaningar och komplexitet för att hålla din organisation säker.However, it also introduces new challenges and complexities for keeping your organization secure. En IT-team för att få ut mesta möjliga av molnprogram, måste de hitta rätt balans mellan att bevilja åtkomst kontroll för att skydda viktiga data.To get the full benefit of cloud applications, an IT team must find the right balance of supporting access while maintaining control to protect critical data. 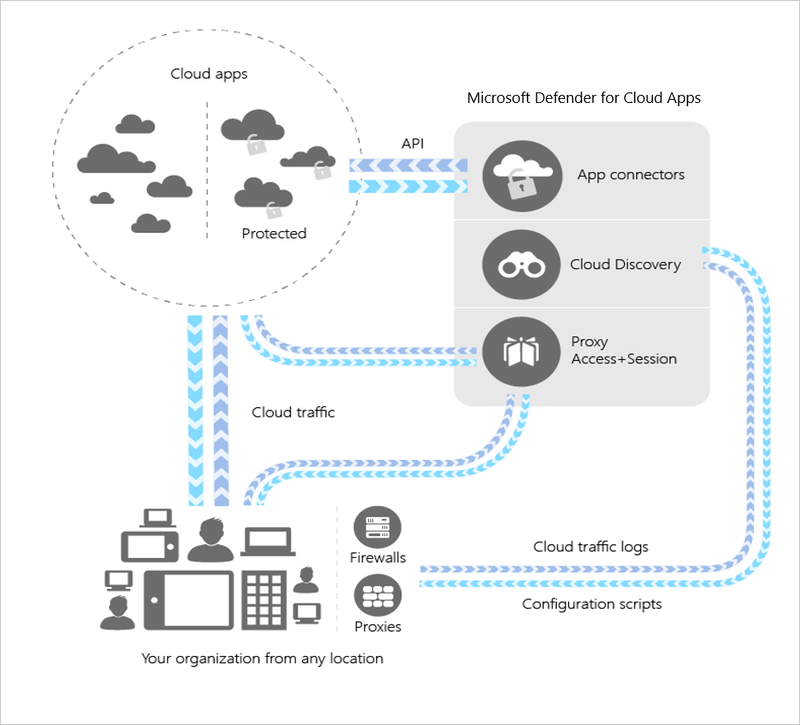 Cloud App Security är en fundamental komponent i Microsoft Cloud Security-stacken.Cloud App Security is a critical component of the Microsoft Cloud Security stack. Det är en omfattande lösning som kan hjälpa din organisation när du flyttar till dra full nytta av molnapparnas potential, men behåller du kontrollen med ökad insyn i aktiviteten.It's a comprehensive solution that can help your organization as you move to take full advantage of the promise of cloud applications, but keeps you in control through improved visibility into activity. Det hjälper också till att bättre skydda viktiga data i molnappar.It also helps increase the protection of critical data across cloud applications. Med verktyg för att upptäcka Shadow IT, utvärdera risker, genomdriva principer, undersöka aktiviteter och stoppa hot kan organisationen migrera till molnet på ett säkrare sätt samtidigt som ni behåller kontrollen över viktiga data.With tools that help uncover shadow IT, assess risk, enforce policies, investigate activities, and stop threats, your organization can more safely move to the cloud while maintaining control of critical data. Information om licensiering finns i den Microsoft Cloud App Security licensiering datablad.For information about licensing, see the Microsoft Cloud App Security licensing datasheet. Cloud Discovery: Identifiera all molnanvändning i din organisation, inklusive skugg-IT-rapportering och kontroll och risk utvärdering.Cloud Discovery: Discover all cloud use in your organization, including Shadow IT reporting and control and risk assessment. Dataskydd: Övervaka och styr dina data i molnet genom att få synlighet, tillämpa DLP-principer, aviseringar och undersökning.Data Protection: Monitor and control your data in the cloud by gaining visibility, enforcing DLP policies, alerting, and investigation. Skydd mot hot: Identifiera avvikande användning och säkerhetsincidenter.Threat Protection: Detect anomalous use and security incidents. Använd beteendeanalys och avancerade undersökningsverktyg för att minska riskerna och ange principer och varningar som ger dig fullständig kontroll över molntrafiken i nätverket.Use behavioral analytics and advanced investigation tools to mitigate risk and set policies and alerts to achieve maximum control over network cloud traffic. via Cloud Discovery för att mappa och identifiera molnmiljön och molnapparna som din organisation använder.Using Cloud Discovery to map and identify your cloud environment and the cloud apps your organization is using. sanktionering och borttagning av appar i molnet.Sanctioning and unsanctioning apps in your cloud. med hjälp av enkla att distribuera appanslutningsverktyg som utnyttjar providerns API: er för synlighet och styrning av appar som du ansluter till.Using easy-to-deploy app connectors that take advantage of provider APIs, for visibility and governance of apps that you connect to. Använda Appkontroll för villkorsstyrd åtkomst protection för att få insyn i realtid och kontroll över åtkomst och aktiviteter i dina appar i molnet.Using Conditional Access App Control protection to get real-time visibility and control over access and activities within your cloud apps. stöd för kontinuerlig kontroll genom inställningen och kontinuerligt finjustera, principer.Helping you have continuous control by setting, and then continually fine-tuning, policies. Läs mer om Microsoft Cloud App Security datalagring och regelefterlevnad, Microsoft Cloud App Security datasäkerhet och sekretess.For more information about Microsoft Cloud App Security data retention and compliance, see Microsoft Cloud App Security data security and privacy. Cloud Discovery använder dina trafikloggar för att dynamiskt identifiera och analysera vilka molnappar som används i organisationen.Cloud Discovery uses your traffic logs to dynamically discover and analyze the cloud apps that your organization is using. Om du vill skapa en ögonblicksbildsrapport för organisationens molnanvändning kan du manuellt överföra loggfiler från brandväggar eller proxyservrar som ska analyseras.To create a snapshot report of your organization's cloud use, you can manually upload log files from your firewalls or proxies for analysis. Om du vill konfigurera kontinuerliga rapporter använder du logginsamlare i Cloud App Security för att regelbundet vidarebefordra loggar.To set up continuous reports, use Cloud App Security log collectors to periodically forward your logs. Mer information om Cloud Discovery finns i Set up Cloud Discovery (Konfigurera Cloud Discovery).For more information about Cloud Discovery, see Set up Cloud Discovery. Du kan använda Cloud App Security för att sanktionera eller ta bort sanktioneringen av appar i organisationen med hjälp av molnappkatalogen.You can use Cloud App Security to sanction or unsanction apps in your organization by using the Cloud app catalog. Microsofts team med analytiker har en omfattande och ständigt växande katalog med över 16 000 molnappar som rangordnas och poängsätts baserat på branschstandarder.The Microsoft team of analysts has an extensive and continuously growing catalog of over 16,000 cloud apps that are ranked and scored based on industry standards. Du kan använda molnappkatalogen för att bedöma riskerna med dina molnappar baserat på officiella certifieringar, branschstandarder och bästa praxis.You can use the Cloud app catalog to rate the risk for your cloud apps based on regulatory certifications, industry standards, and best practices. Du kan sedan anpassa poängen och vikten för olika parametrar utifrån organisationens behov.Then, customize the scores and weights of various parameters to your organization's needs. Baserat på dessa poäng bedömer får Cloud App Security du reda på hur riskfylld appen är.Based on these scores, Cloud App Security lets you know how risky an app is. Bedömning baseras på över 70 riskfaktorer som kan påverka din miljö.Scoring is based on over 70 risk factors that might affect your environment. Appanslutningsverktyg använder API:er från molnapp-providrar för att integrera Cloud App Security-molnet med andra molnappar.App connectors use APIs from cloud app providers to integrate the Cloud App Security cloud with other cloud apps. Appanslutningsverktyg förbättrar kontroll och skydd.App connectors extend control and protection. De ger dig också tillgång till information direkt från molnappar för Cloud App Security-analys.They also give you access to information directly from cloud apps, for Cloud App Security analysis. Om du vill ansluta en app och utöka skyddet ger administratören Cloud App Security behörighet att få åtkomst till appen.To connect an app and extend protection, the app administrator authorizes Cloud App Security to access the app. Cloud App Security efterfrågar sedan aktivitetsloggar i appen och genomsöker data, konton och molninnehåll.Then, Cloud App Security queries the app for activity logs, and it scans data, accounts, and cloud content. Cloud App Security kan genomdriva principer, identifiera hot och tillhandahålla styrningsåtgärder för problemlösning.Cloud App Security can enforce policies, detects threats, and provides governance actions for resolving issues. Cloud App Security använder API:erna från molnprovidern.Cloud App Security uses the APIs provided by the cloud provider. Varje app har ett eget ramverk och API-begränsningar.Each app has its own framework and API limitations. Cloud App Security samarbetar med appleverantörer om hur du optimerar användningen av API: er för att säkerställa bästa prestanda.Cloud App Security works with app providers on optimizing the use of APIs to ensure the best performance. Cloud App Security-motorerna utnyttjar den tillåtna kapaciteten och gör det med hänsyn till de olika restriktioner som apparna tillämpar på API:erna (t.ex. begränsningar, API-gränser och API för dynamisk tidsväxling).Considering the various limitations that apps impose on APIs (such as throttling, API limits, and dynamic time-shifting API windows), the Cloud App Security engines utilize the allowed capacity. Vissa åtgärder, t.ex. genomsökning av alla filer i klienten, kräver ett stort antal API: er, så att de är fördelade över en längre period.Some operations, like scanning all files in the tenant, require a large number of APIs, so they're spread over a longer period. Det innebär att det kan ta flera timmar eller flera dagar att köra vissa principer.Expect some policies to run for several hours or several days. Du kan använda principer för att definiera användarnas beteende i molnet.You can use policies to define your users' behavior in the cloud. Använd principer för att identifiera riskfyllt beteende, brott eller misstänkta datapunkter och aktiviteter i molnmiljön.Use policies to detect risky behavior, violations, or suspicious data points and activities in your cloud environment. Vid behov kan du använda principer för att integrera processer för åtgärder som minskar riskerna.If needed, you can use policies to integrate remediation processes to achieve complete risk mitigation. Typer av principer motsvarar de olika typerna av information som du kanske vill samla in om molnmiljön och de olika typerna av åtgärder som du kan vidta.Types of policies correlate to the different types of information you might want to gather about your cloud environment and the types of remediation actions you might take. Läs om grunderna i Komma igång med Cloud App Security.Read about the basics in Getting started with Cloud App Security. Premier-kunder kan också skapa en ny supportbegäran direkt i Premier-portalen. .Premier customers can also create a new support request directly in the Premier Portal..